Janelle Monae. Cindi Mayweather, the Archandroid from Metropolis. And now, The Electric Lady. Artists who challenge the status-quo are often met with criticism and skepticism. Female artists who choose not to over-sexualize their image to avoid compromising the quality of their music are typically overlooked. So how does the soulful, yet ecclectic Janelle Monae manage to not only stay afloat in a watered-down industry, but far exceed expectations with her sophomore effort "The Electric Lady?" For one, she is a smart businesswoman. Even though she is technically signed to Bad Boy Records, she is able to maintain creative control of her entire brand. It would be rude to say she is just using Sean Combs for his money, so for the sake of being politically correct, it's probably safer to call it a business partnership. Janelle is an amazing artist and her growth is only aided by the choice selection of influences and mentors she surrounds herself with. Throughout her young career she has befriended several well established artists and legends such as Big Boi, Cee-Lo Green, Erykah Badu, and Prince (the latter two of whom are featured on The Electric Lady) who have helped mentor and nurture her growth while she embarks on a journey that few from this planet can even grasp. Her style of music across her EPs and studio albums have been nothing short of masterpieces. To the laymen, she crafts stories around individualism and the freedom of expression in a world of conforming to social norms. 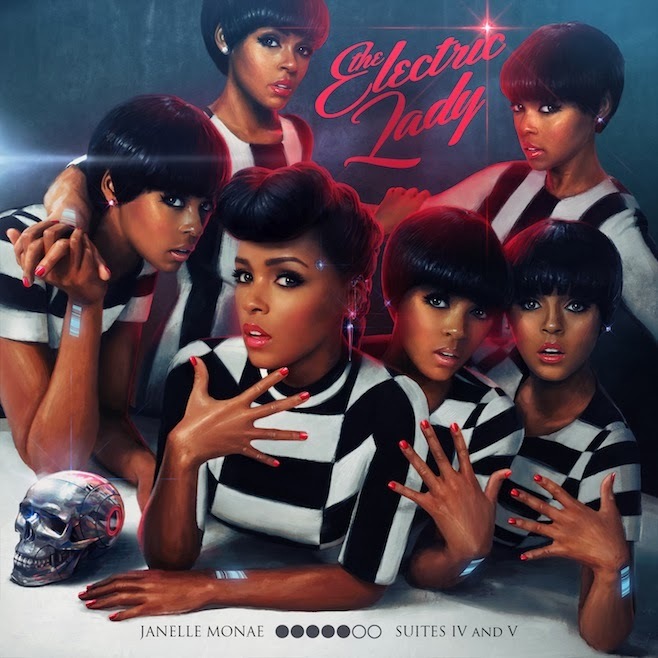 The Electric Lady, Monae's second studio album, is a mash-up of Soul, Rock, R&B, Jazz, and Hip-hop. There is no way to lump her music within a single genre, because that would be going against what she stands for as an artist. With songs like "It's Code," you hear glimpses of Jackson 5 era Michael Jackson. You also can see Prince's influence with songs like "Primetime," a duet with Miguel. Her albums also have a distinct cohesiveness and flow to them from track to track that is rarely found in moden day music. The journey she takes you on throughout this 19 track effort are virtually flawless. You will be hard pressed to find an album of this length that is consistently fantastic from beginning to end. An absolutely stellar effort. One that, in due time, has the potential to be praised and immortalized among the greatest albums of all time. Any true lover of music would be doing themselves a disservice to not own this album.